There has been some changes in the strategy of Demon Wall. There were some mistakes in it and I have now referred to TFMurphy’s guide. 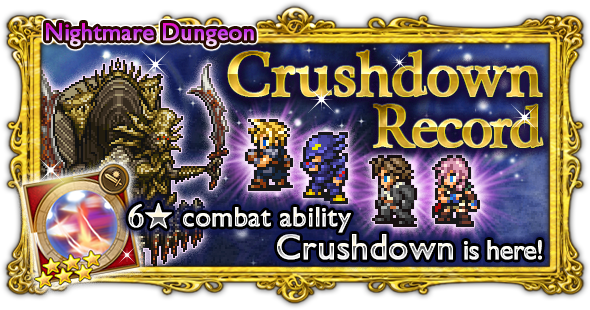 Crushdown is a 6★ Combat ability. It deals 2 physical attacks with a high chance of KO. Cleave: Deal physical damage to all targets. Rush: Deal special physical damage and Sap one target. Inflict Poison and use defensive Breakdowns + Protectga. Draw Fire + Retaliate works well. Recommended RW: Lunatic High, SG/SS2, etc. Afflict Hill Gigas with Slow. Do not use Black Magic on Hill Gigas. Poison Fog: Deal poison damage and Poison all targets. Curaja: Restores a large amount of HP to one target. Hip Hop: Deal physical damage to one target. Recommended RW: SG/SS2, Boon, Lunatic High, Mighty Guard, etc. Defeat the Iguions without being KO’d. Exploit Iguion’s weakness to holy attacks. Do not use fire attacks against Iguion. Attack: Deal physical damage and Slow one target. Attack: Deal physical damage and Sleep one target. 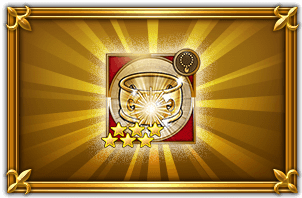 Resonance: Deal special non-elemental magic damage to all targets. These Iguions have high RES. Use physical attacks instead. Banish Raid is excellent here. Exploit Motor Ball’s weakness to lightning attacks. Do not use fire attacks against Motor Ball. Arm Attack: Deal physical damage to one target. Twin Burner: Deal moderate fire damage to all targets. Rolling Fire: Deal heavy fire damage to all targets. Deadly Wheel: Deal massive physical damage to all targets. Lunge: Deal physical damage to all targets. Again, Motor Ball has high RES, so resort to spellblades for effective damage. Its physical and magic attacks hurt so apply necessary buffs/ Breakdowns. Lightning’s SSB is very potent here. You can even bring it as an RW. Do not use Black Magic on Demon Wall. Defeat Demon Wall without it using Gravija. Defeat Demon Wall without it using Crashdown. The Arms do nothing on their turn. However, if they take damage from a counterable ability used by a Marked party member, they will counter with Annul (NAT: 100% chance of reducing random Ability’s uses by 35% – Targets random character with Ability uses remaining). Demon Wall begins battle with a completely empty ATB. All of Demon Wall’s attacks are treated as instant actions, meaning that it requires no Cast Time to use anything. On Demon Wall’s first three turns, if any party member has the Retaliate status, Demon Wall will actively target a random party member who has Retaliate with Contempt (NAT: 800% Phys Dmg, 100% chance of curing Retaliate), instead of using a random action. On Demon Wall’s 4th turn, it will use Gravija (NAT: AoE – 303% chance of 70% CurHP Dmg, resisted via Death) instead of a random action. Phase 1 ends when either Demon Wall is brought under 71% HP, or Demon Wall uses Gravija. When Phase 2 begins, Demon Wall’s ATB will be reset, and Left Arm and Right Arm will become active. Demon Wall will also use Dynast-King’s Curse (NAT: Null Action) immediately as the Phase starts. A group will not be chosen if there are no alive party members inside it. A group will not be chosen if all of the currently alive party members are inside it. A group will not be chosen if it was picked the last time Dynast-King’s Curse was used, unless it is the only possible grouping that satisfies the first two conditions. If there is only one alive party member, then the other conditions are ignored, and all three groups are possible (even those that were picked last time or have no party members in them at all). Out of these valid possible groupings, one is then picked at random. The party members inside the grouping are considered Marked. Note that all three groupings include the party member positioned in the exact center. An aura will gradually progress along the marked area as time passes, at a rate equal to 30% over the time it takes Demon Wall’s ATB to fill once (8.777 seconds to fill to 100%). As an indicator of this, the aura will visibly advance at 10%, 40%, 70% and 100% filled. If the aura fills to 100%, Demon Wall will immediately use Nightmare Gravity (NAT: AoE – Auto-hit 80% CurHP Dmg + Auto-hit Sap), which hits only currently Marked party members. The aura can be pushed back by damaging Demon Wall. Marked party members that damage Demon Wall will push the aura back at a rate equal to 1% per 800 damage inflicted (9999 damage would push back the aura by 12.499%). Party members that are NOT marked will instead cause the aura to surge forward by 1% per 100 damage inflicted to Demon Wall (9999 damage would cause a surge of 99.99%). Note that the aura cannot be pushed back past 0% full. Dynast-King’s Curse only lasts a certain amount of time. While it will expire prematurely if it fills to 100%, it will also expire naturally after 10.532 seconds, the time it takes for Demon Wall’s ATB to fill four times. Using Interrupt on Demon Wall will delay its next turn, but will not extend the duration of Dynast-King’s Curse. If it expires without reaching 100%, there is no penalty. The full duration of Dynast-King’s Curse is enough time for the aura to fill to 120%. This means that the aura must be pushed back by over 20% progress (16k damage) to avoid Nightmare Gravity, but remember that any extra damage that attempts to push back past 0% full is wasted. Once Dynast-King’s Curse has expired, Demon Wall will reset its ATB and immediately use Dynast-King’s Curse again as an instant action, marking new targets. Once the 4th Dynast-King’s Curse has expired, Phase 2 will end. All of Demon Wall’s attacks are treated as instant actions, meaning that it requires no Cast Time to use anything. On Demon Wall’s turn, if any party member has the Retaliate status, Demon Wall will actively target a random party member who has Retaliate with Contempt (NAT: 800% Phys Dmg, 100% chance of curing Retaliate), instead of using a random action. 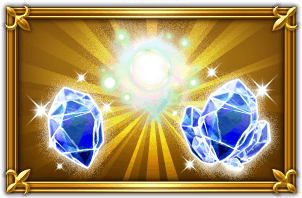 Phase 2 ends when the 4th use of Dynast-King’s Curse expires. As the phase ends, Demon Wall will use Wail (NAT: AoE/LR – 220% Phys Dmg, 123% chance of Silence) if both Left Arm and Right Arm are dead. If either Arm is still alive, Demon Wall will use Nightmare Crushdown (NAT: AoE/LR/AutoHit – 999% Phys Dmg, Ignores Def) instead. When Phase 3 begins, Left Arm and Right Arm will be removed from battle, and Demon Wall’s ATB will be reset. After each of the first four turns in this phase, Demon Wall will move closer to the party. On Demon Wall’s 5th turn, and every 2nd turn after, Demon Wall will use Nightmare Crushdown (NAT: AoE/LR/AutoHit – 999% Phys Dmg, Ignores Def) instead of a normal action. If Demon Wall is using Nightmare Contempt and at least one party member has the Retaliate status, Demon Wall will actively target someone with Retaliate instead of attacking randomly.